The puzzle is one of sheer efflorescence: why do the Mayongians of Central Assam (Northeast India), with whom I conducted ethnographic fieldwork for over two years, keep so many accounts, financial and otherwise? In Mayong—a kingdom/village cluster on the Southern bank of the Brahmaputra, renowned for a tradition of sorcery—accounts are everywhere. Numeric and narrative, they are at the communicative heart of economy, ritual, political authority, and history. Accounts are kept of one’s life, name and death; of sorcery, kingship and kinship; of collecting bamboo from the forest and of harvesting rice from the floodplains. Almost every action or event of value (economic or otherwise) has an account attached to it. Such accounts are records, to be sure. But they are also artful arguments about how a social relationship is to be remembered, stored, accessed, mobilized, manipulated—how it is told and retold, hidden and revealed. I would contend that this abundance of accounts not only says something about Mayongian history and society in particular. It also allows us to refine our understanding of accounting in general. Figure 1: A replica and translation of an entry in a daily cash ledger. Note that in the ledger entry itself, there is no mention of what was sold, a date for transactions, or names associated with the transactions. Nor, does the ledger show a carry over amount from how much existing cash on hand was held in deposit from previous transactions. Basic knowledge of accounting has long been considered the key to prosperity—whether one is managing a business or a household. Yet, in using accounting training as a key method of poverty alleviation, initiatives for financial inclusion or rural development have tended to obscure existing strategies as well as non-economic modes of reckoning that poor populations in non-Western contexts mobilize to manage and manipulate their economic lives. By focusing on the logics, techniques, and technologies of accounting for cash and cashless transactions (such as debts, gifts, commodities, barter, and livestock redistribution) my research explores how and why Mayongians symbolically manage finances at the intersections between cosmology and socio-economic life—between forces of spiritual and socially mediated material prosperity, and between the part-whole dynamics that objectify activities of payment and exchange. Doing so opens up an ethnographically driven, and holistically attuned, theoretical space to explore how and why a people account—not only for economic reality but also to each other as a moral practice. Talk of “accounts” (hisap) dominates many aspects of life in Mayong. People speak of “accounting” both literally and metaphorically. In Axomiya, hisap can mean narration, calculation, counting, equivalence, tidiness, management, or sufficiency depending on context. But the term has a tropic value flooded with moral and poetic valence, as in “Bhaiti, hisapot solabi!” (“Little brother, act with calculation!” literally: “Little brother, move within the account”). Single-entry cash ledgers (hisapor kitap / tokar bohi) are perhaps the most common (if least ubiquitous) means of financial reckoning. Every household keeps these on hand—usually packed away in chests, or stuffed into the hollows of bamboo pillars (sunga / chunga) that support a house. They often rot away, and are rarely consulted, unless an emergency happens. A sudden loss of income, for example, might compel a search for an old debt that could be collected. For households, they serve as means for tracing expenses and income collectively and individually. The basic procedure is one of rolling a credit (joma) over at the end of every list of transactions, to be put against the next set of expenses or income. Yet, in most individual cash ledgers, methods of rolling over credits or tracking deposits are not always followed strictly or carefully (see Figure 1). A slip of paper here, a notebook there, all cluttered with loosely traced amounts and minimal details might suggest a haphazard approach to financial reckoning. But, this minimalism is far from haphazard. Every time I had a chance to look through a household ledger, I was asked not to photograph anything in it. 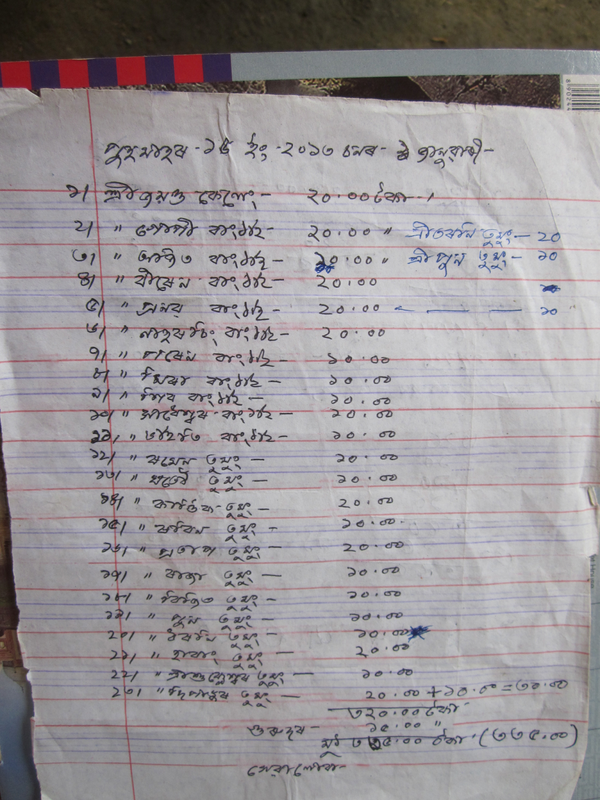 When I asked why, I was told that household ledgers are secretive (surang; moni-moni). Here we must be very careful to not smuggle in our own moral associations about why certain kinds of economic knowledge are secretive. Indeed, as I asked repeatedly why these cash ledgers are kept secret, the tone of dialogue consistently turned toward the solemn and subdued, rather than the defensive and possessive. Put quite elegantly by my friend Saritra Biswas, “Eito ‘Jadu Mayong’, surang hisapot solabo lagibo.” (This is “Magic Mayong,” you must move within the account discreetly.” Or “This is “Magic Mayong,” you must move in a discreetly calculated way”). Shared accounts are open to public audit and inspection. They are neither minimalist nor hidden, but elaborate, expository, liturgical, and even sometimes double entry. Within these accounts fines accrued from the breaking of taboos are reckoned, expenditures from ceremonies, marriages, mortuary rites, and name-giving rites recorded, and the circulation and redistribution of livestock carefully tracked. All of these accounts are public (raijor hisap). For an example of this kind of account, see Figure 2. The analytical distinction I am making between “shared” and “secret” accounts (more on these to follow in my forthcoming blog posts) is an ethnographically driven one. Mayongians make distinctions between particular kinds of accounts on a token-by-token basis, and sometimes as a typological distinction between accounts of discretion and accounts of public audit. In my next blog post I will turn to the qualities and implications of this distinction between secret and shared accounts, a distinction that can also be nullified when we consider these accounts as modes of historiography.